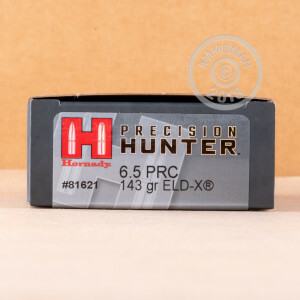 Give your 6.5 PRC rifle the terminal performance and accuracy it was created to deliver with this cartridge from Hornady’s Precision Hunter line of ammunition! The round sports its Nebraskan manufacturer’s revolutionary ELD-X projectile, which creates exceptional damage from virtually any distance. At higher velocities the bullet’s expansion and deep penetration are guaranteed by its InterLock ring, which promotes up to 60 percent weight retention. From farther out the ELD-X’s polymer tip initiates similar expansion with up to 90 percent weight retention. That is not just any polymer tip, however. 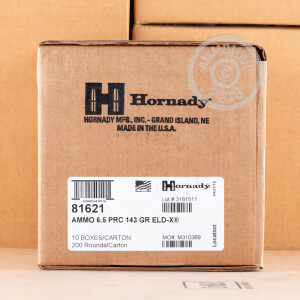 It’s Hornady’s patented Heat Shield tip, which lends much to the ELD-X’s tack driving accuracy because its perfect symmetry won’t be destroyed by the friction created by air resistance. This bullet further boasts a boat tail design which heightens its ballistic coefficient, as well as a secant ogive profile and remarkably concentric AMP jacket. With so high a ballistic coefficient and its ability to devastate whatever target receives it, the ELD-X is in a class of its own when it comes to buck hunting. 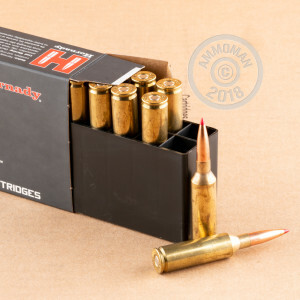 Order these 200 rounds and you’ll be able to practice amply in anticipation of the next season. Best of all, the shipping and handling will be on us!